The way we shop has evolved drastically in the recent times, from buying from kirana shops and organised retail chains to the e-commerce boom. This led one software development engineer Sujayath Ali to wonder how shopping will happen 20 years down the line. "Maybe everyone will have their own online personal shopping assistants who will ensure that the dresses suit the buyer and are well within their budgets," said Ali. "I was personally very dissatisfied with the online clothes buying experience. I even moved to premium brands, tried trendy clothes and followed celebrities' styles, but nothing worked. And if I don't need to be an electronics expert to buy the best gadget at Amazon, why should I be a fashion expert to buy the best clothes," he added. 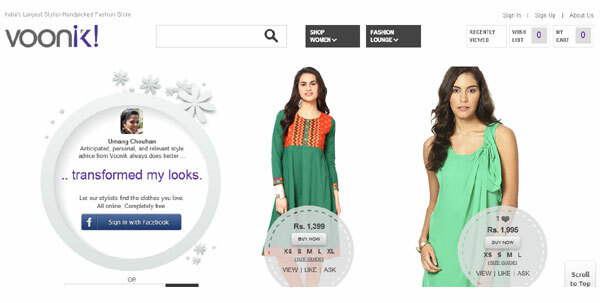 This thought process finally gave birth to Voonik.com, a platform that uses inputs such a body shape, skin tone, height and personal style and tastes to help customers choose the best possible product for them. For instance, if the person is looking to buy a kurti and their style preference is conservative, body shape is round, skin tone is medium and he/she is tall, Voonik will advise them to purchase 'a printed knee length kurti, with sleeves that have some sort of embellishment or detailing around the neckline', in order to draw attention away from the stomach. The accessories to go along with the kurti will be more prominent and the kurti would be teamed with 'chudi' bottoms for a slimmer look. In addition, the colours would be brighter to bring out the best in the buyer's skin tone. The logic is that while purchasing apparel, buying by just price or colour or discounts is not the right way. It should be more about the user's style preferences and body type. "We want to bridge the gap between a fashion expert and a common man by providing a free-of-cost online personal stylist. What powers Voonik is the 'personalisation-on-steroids' platform that understands the users, shows them the right style recommendations, and personalises the content and the presentation," says Ali, who co-founded the startup along with Navaneetha Krishnan in January 2013 with Rs 50 lakh from their own pockets. Ali, who was working as a senior product manager at Amazon in the US, left his job and moved back to India to start Voonik. "All the recommendations are algorithmified. And besides details on the style preference, body shape, height and skin tone, the shadow profile of the individual is continuously updated based on their browsing and mouse clicks," he said. Presently, the portal showcases about 5,000 women's products from top online retailers including Zovi, Fashionara, Jabong and Myntra. "Initially, we launched the portal for both men and women. But then we realised that women were reacting more favourably to our value proposition. So even though it had started solving my personal problem, we decided to shut the men's section and focus on Indian women aged between 18 and 30 years," mentions Ali. The portal has over 35,000 registered customers and is getting up to 90 orders a day from mainly North India. "On good days, we have also clocked sales of Rs 60,000-70,000, of which our margin is 15 per cent. The average ticket size of the items sold on the platform is Rs 1,000," said Ali. The Chennai-based startup has a 12-member team. The company is set to receive Rs 2.5 crore from Seedfund, an early stage venture capital fund since it won Bloomberg TV's Pitch Season 3. It is also among the 16 startups picked for Microsoft Ventures' summer acceleration program.